This year we chose to use the site at High Cross Business Park near to my office in Sharnford. It would be true to say that we were in it, but not exactly to win it. Participants operating were Mark Burrows (2E0SBM), myself (G1KFB), Phil Haywood (M0VVZ), Alban Fellows (G7UGC) and Vinny Hopkins (M0TAV). We had a welcome visit from Steve Nightingale too so that in the end we had a decent turn out. We had a lot of fun establishing a contest station at the top of an adjacent hill in a gazebo. We had a portable generator, sufficient tables and chairs and decent enough weather to stay out for the duration. Add in some food and a lot of laughs and the rest was detail. We operated in two bands, 2m and for the first time, 23cm. 2m was the primary band but conditions were truly awful, a completely flat band. There were very few QSOs by any station over 1000km which is unusual because even with moderate conditions, the bigger stations can work well in excess of this. There was no hurry to get going on 23cm as we didn’t have many operators, we were having a lot of fun anyway and it meant assembling the world’s most fiddly aerial. Alban Fellows and Phil Haywood eventually got it sorted after three hours of having a go, reverting to the manual and having more goes. 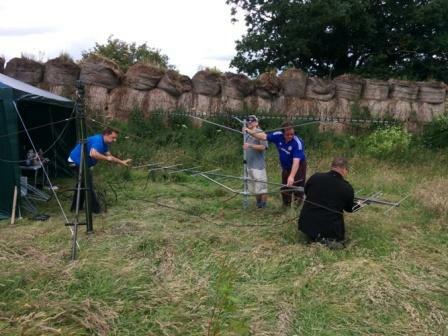 Although we didn’t have a VNA for 23cm, we had a properly rated SWR meter and the antenna….. was right first time! Brilliant job. All 55 elements in the right place! Back to the operating: It became clear that we weren’t going to get very far with either band and attention turned towards food and rations and away from operating! 23cm – FT-736R (number 2) 8W, Westflex 103 (lossy at 1296MHZ), 55 element Tonna, 40ft Racal. Overall we came 16th out of the pitiful total number of stations entered in our restricted category, 18 (we could have entered low power on both bands and finished further up the ladder). On 2m we had 31 QSOs with best DX 586km into Germany. On 23cm we only had 4 contacts with best DX 373kM into Wexford, ROI. Although it’s by far our worst performance in VHF NFD, the participants very much enjoyed this event. We achieved an entry under our own steam and we managed to really enjoy the whole thing. There is a lesson to be learnt somewhere in there. We’re keen to run it again from this location. Going forwards, we may take more seriously the technical side of things – have more power, enter the appropriate category, use preamps and hardline coax etc but for this year, having more time to talk and laugh is what we’ll probably remember best.